Dandelions: A Weed or Not? One of the first signs that spring has sprung to me is bright yellow Dandelions everywhere! I am sure most everyone has memories of blowing the seeds or catching the seeds to make a springtime wish. When did these flowers become the enemy of green lawns everywhere? Just recently in the twentieth century these nutritious flowers only started being culturally considered weeds. 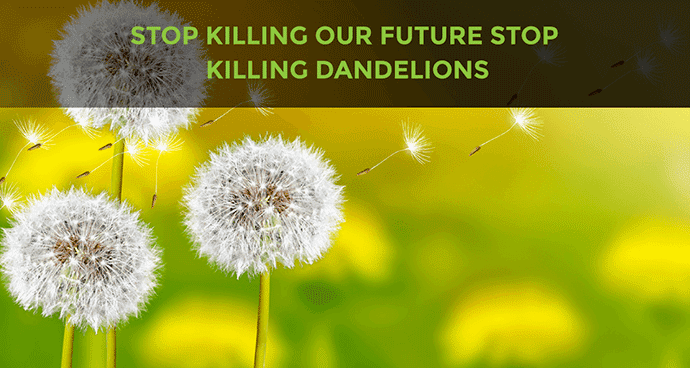 It seems that every single brand of chemical herbicide is targeting the dandelions. A plant that costs over thirty-five dollars in the grocery store for some of its products. People pay outrageous amounts for a plant that gets targeted as a weed. Dandelion is in a lot of dietary products as well as in honey, teas, soups, and wine. Additionally, the root is grounded up and roasted to become a decaffeinated coffee alternative. That’s not even counting the endless nutrition benefits from Dandelion Greens. Dandelions Greens are best harvested in the spring when the shoots are young and tender. They have 112 percent of the minimum daily requirement of vitamin A. Dandelion greens are also high in fiber. These greens also contain vitamins C and B6, thiamin, riboflavin, calcium, iron (crucial for generating red blood cells) and, potassium (to help regulate heart rate and blood pressure). Other nutrients present in dandelion greens include folate, magnesium, phosphorus, and copper. They have more vitamin A than spinach, more vitamin C than tomatoes. You can check out the full Nutrition Value here! The first aspect that I want to get into the benefits of dandelions on the soil is that they are great for the pollinators. Dandelion has one of the longest seasons starting in early spring. The flower provides nectar and pollen for the hungry pollinators (the bees, hummingbirds, and butterflies). These pollinators are losing more sources of nectar and pollen because of all the chemicals especially the herbicides killing off the dandelions. Dandelions have wide-spreading roots that loosen the hard-packed soil. That can aerate the earth and help reduce erosion. These deep root pulls nutrients such as calcium from deep in the soil and makes them available to other plants fertilizing and rehydrating the soil. You can learn a lot by what the weeds in your garden tell you. If you are overwhelmed by Dandelions, your soil may be compacted and disturbed, and nature is trying to improve within itself. Running On That Chemical Treadmill Again? I want to warn pulling out dandelion greens and eating them from property that’s not yours because of unknown chemicals. Herbicides used on lawns take a terrible toll on wildlife. More than seven million wild birds are estimated to die annually due to the use of lawn pesticides. That doesn’t even take into account the decline of the pollinators. Thirty million acres of the United States are lawns, and an estimated 80 million pounds of pesticides are used on them annually. (1). Each dandelion plant can produce 50 to 175 seeds per head, and a single plant can produce up to 20,000 viable seeds. The way dandelions spread their seeds makes running on the Chemical Treadmill endless as the seeds spread more and more you will keep reapplying. We need to go back to the place where every plant, every animal on Earth is a resource. For generations eating dandelions was commonplace. Before the chemical pushing pesticide companies made millions from telling you to keep up with your neighbors that you need to remove these pests. Without Dandelions, you would have more soil erosion, a bigger decline in bees and other pollinators. Adding chemicals even to your own lawn adds to water, air, and soil pollution. You are contributing to Climate Change! You are contributing to the end of Earth as we know it! 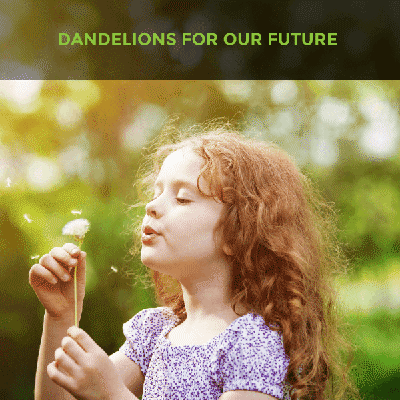 Let’s make a wish on Dandelion Seeds for Greener Tomorrow!